Sepia Saturday’s them for the week – trains, trams, transport. But if I say trains and transport then the next word is troops. I prefer to use images from the family albums but this time I am going with my favorite photo from the State Library of Victoria. 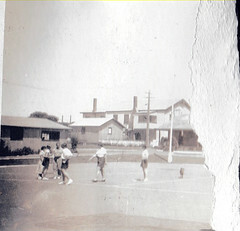 It is listed as being from the Melbourne newspaper of the time, the Argus on August 14th, 1940. However it does not appear in the paper. but is one of a collection which came from the paper. Why ever wasn’t it used. Every photo tells a story and this photo tells a very powerful story. The unanswered question is – Who are these two central people ? Is she his wife, fiancee, girl friend ? 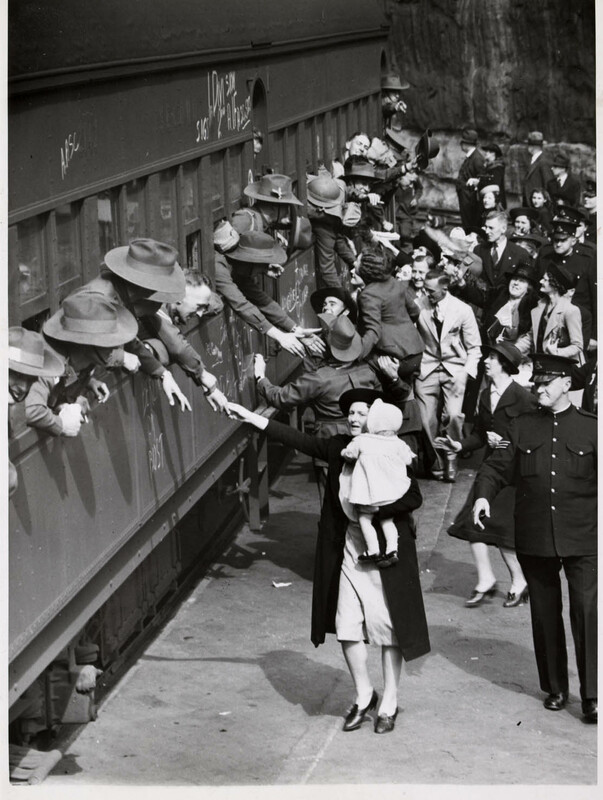 Was this an embarkation leave farewell? Troops were still being sent to the Middle East . Did he come back safely or was he killed at Tobruk like the driver of the bread van in my home town ? In this second photo you can again see her on the shoulder of some strong person. 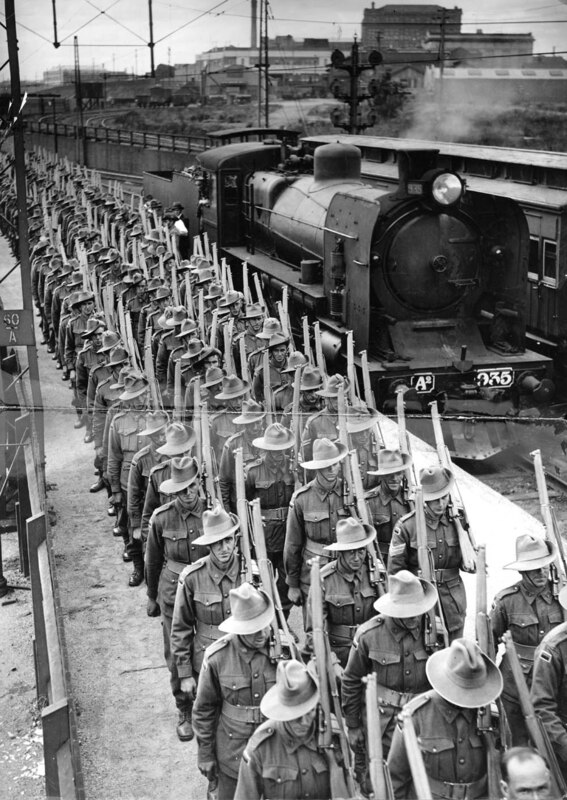 Another time we see the soldiers marching down platform 10A at Spencer St Station in 1944, the engine for their train waiting t in the background. 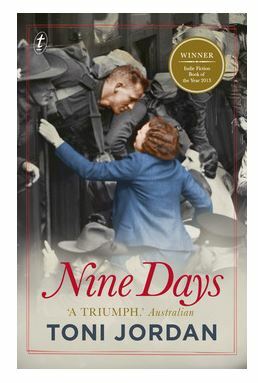 Then in 2012 Toni Jordan published her novel Nine Days which was inspired by the kiss photo. She put her imagination to work to give a story going both back to the past and forward to the future. It is so believable and particularly enjoyable to anyone who enjoys their inner Melbourne suburbs and the idea of life as it was, in this case inner-city Richmond. The photo, with the help of a bit of colour, was used for the cover of the book. And a bit of trivia for the young-uns as to those beautiful marcel waves in the first photo. These days with all the electric wands for straightening and curling you might not know that in the 1930s when these marcel waves were popular, to make them at home you used these torturous butterfly metal grips with sharp teeth which pinched the damp hair together into ridges. 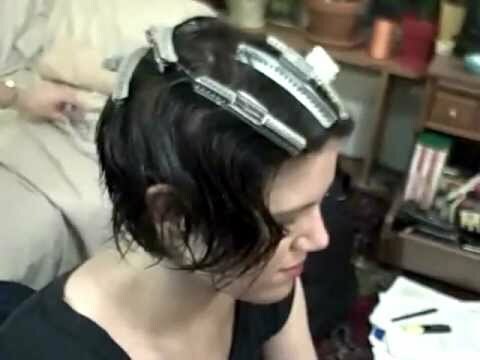 When dry the hair would comb out into waves. Go to Sepia Saturday to read more stories of earth-bound transport of every imaginable kind. 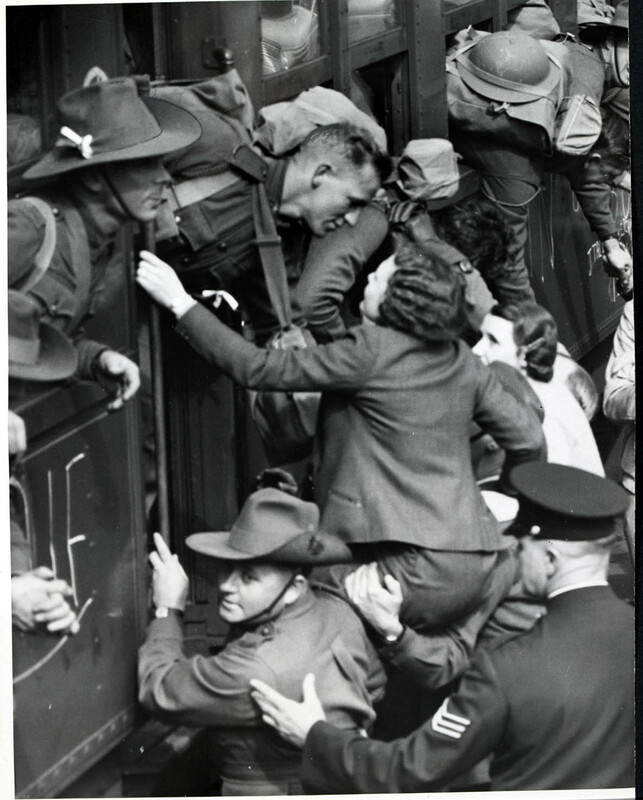 This entry was posted in Authors, Books, History, Uncategorized, War and tagged 1940, farewell, goodbye, kiss, marcel wave, Nine Days, soldier, Spencer St, station, Toni Jordan, train, troops, war on June 13, 2014 by lazycoffees. Happy 200th birthday, Sepia Saturday. I have only been a member of Sepia Saturday for three months which is only 7% of its lifetime. So I was hesitant about re-publishing a post which was only made two months ago. But writing the post was a revelation to me as I started researching what was happening on the date which was written on the photo. This is a method I will continue to use whenever I know when a photo was taken but hopefully won’t be quite as long-winded in future. Our theme for today is groups of three. These three girls were prizewinners at Mrs Burnell’s garden party.in Castlemaine, Central Victoria, on Nov 16th, 1940 . It was part of the way into World War II, when raising money for war effort charities such as the Comfort Fund, Red Cross or Bundles for Britain was the usual reason for holding a money-raising event. It was such a patriotic time, not so long after the last coronation and a new king, with the country at war. Best dresses and hats were brought out for this special occasion, and the pram reflects the feeling at the time with its crown, its Australian flags and red, white and blue bunting.. Crepe paper was the standard material for these creations, willingly constructed by parents. . And the special doll Elizabeth was named ,of course, after Princess Elizabeth. A typical pretty, peaceful, family album picture of the time. But it is what the picture doesn’t show which makes it interesting to me. When the two girls on the right got out of bed that morning they had probably been primed to wish their mother a happy birthday. It was her forty-first birthday. But they would have been blissfully unaware of the reaction of their parents when they opened their morning newspaper of choice, the Argus, from Melbourne, and its news of the war from England. .Two nights before the worst bombing raid on the city of Coventry was carried out. Over 4000 homes were destroyed and over 500 people killed. Coventry was the home of the children’s 90 year old maternal great grandmother. I don’t know long it was to be before the Australian family found out that she was alive and well and was to live for another two years. Then on the night of the garden party the Royal Air Force retaliated by bombing Hamburg. But the children weren’t aware of this. Also on the other side of the world and on that same day the Warsaw ghetto was closed to the outside world by the Nazis. In the previous month the Jewish people of Warsaw, about one third of the total population , had been rounded up by the Nazis and confined to a small are of the city, These 400,000 people were held behind three metre high walls topped with barbed wire. And on this fatal day the gap was closed. Thirty percent of the population crowded into two and a half percent of the area. The garden party was held at the home of Mr and Mrs Burnell, a beautiful home with a large front lawn suitable for all the stalls and competitions that go with a fund-raising garden party. It was directly across the road from Thompson’s Englineering & Pipe Works, established in 1875, where Mr Burnell was the General Manager. 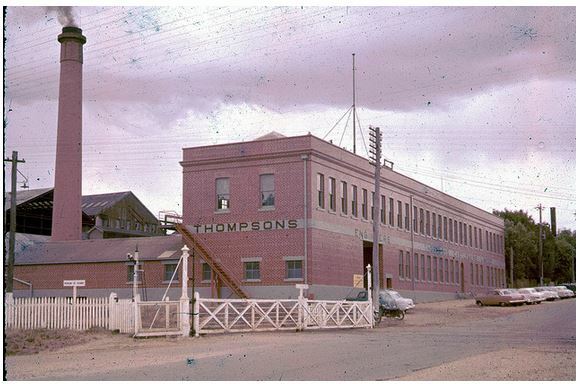 He had won the MC during WorldWar I. Thompson’s was the most important business in Castlemaine, commonly known as Thompson’s Foundry and was spread out alongside the main railway line from Melbourne to Bendigo, an ideal position for transporting the heavy goods which it made, a wide range of steam-engines, boilers, mining machinery, railway equipment and centrifugal pumps. But during World War II they made artillery and tank guns, marine engines, circulating pumps and other heavy forging and foundry work. Making guns for war, what the children didn’t know. How’s this for a crankshaft ? The eldest girl in the photos remembers the workmen on their pushbikes, four and five abreast, sweeping up and down the Main Street on their way to and from work. With such a large work force the foundry had a piercing whistle which screamed out at 7.00am, 7.20am and 7.30am. There was no excuse for being late for work and the whole town and beyond had its own non-negotiable alarm clock. Small towns are such a web of people and places. 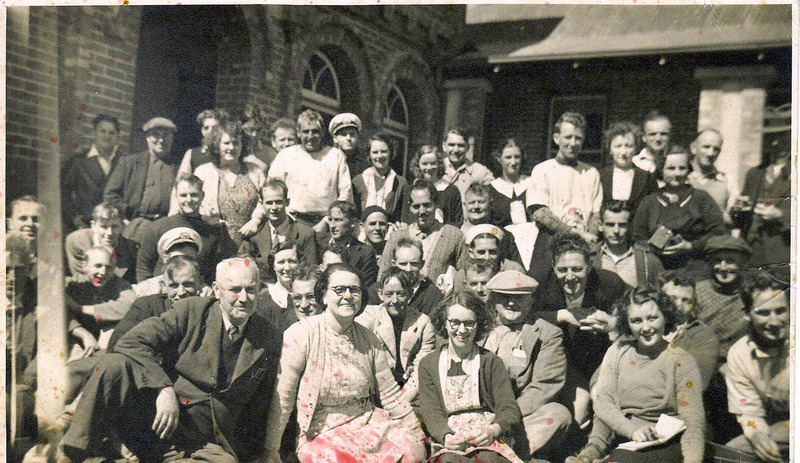 The mother of the two girls on the right had originally come to Castlemaine with her parents as from 1923 to 1928 her father worked in the office at Thompson’s and was Bandmaster of Thompson’s Foundry Band. This is the same man who brought a book on Shakespeare with him when he came to Australia. The man really did have itchy feet and jumped as bandmaster from one small country town to another several times. The Foundry has had its own brass band since 1887 and 24 members of the band served in World War I, six of whom were killed. I have no figures for the Second World War. When is the world going to learn . 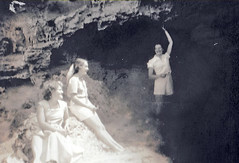 And for more interesting stories about groups of three, click on the links in Sepia Saturday. 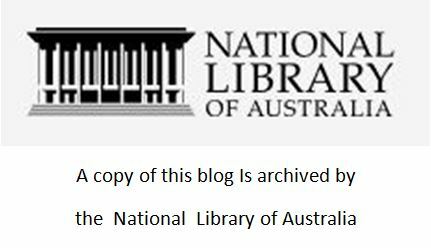 This entry was posted in Castlemaine, Family History, Family Stories, Genealogy, History, Uncategorized, War and tagged 1940, band, bombing, Burnell. Thomson's Foundry, Casttlemaine, Coventry, garden party, November 16th, Warsaw ghetto on October 28, 2013 by lazycoffees. Take one lighthouse, a harbour and some boats, stir in Eric the Red and the City of Rayville, and what do you get ? 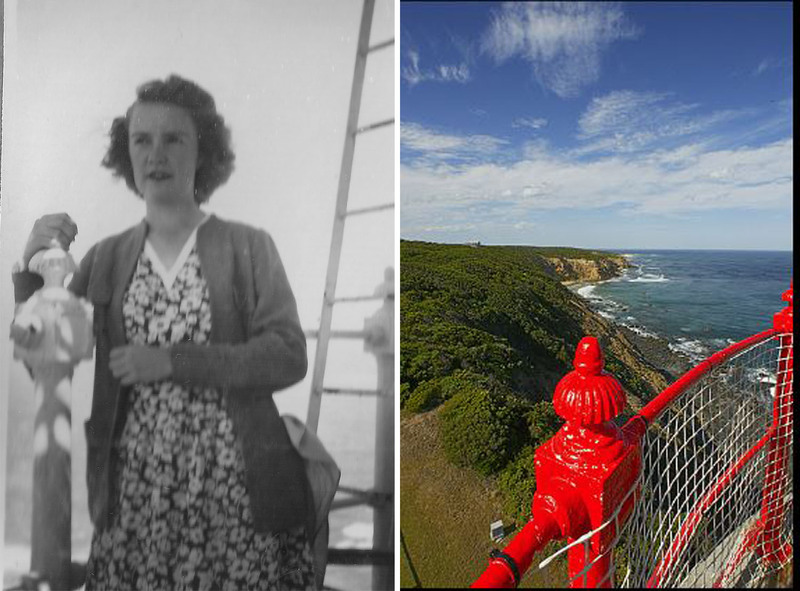 Answer – The Cape Otway Lighthouse. Note Some readers have questioned the use of oldest above so I have added some further notes at the end of the page. That tall radio mast has now disappeared. There were many shipwrecks along the Australian coast and the reefs around Cape Otway had their fair share.. As Apollo Bay was a fishing village the fishing boats became used to turning out to help ships in trouble. Some of the shipwrecks were quite notable. The survivors were well looked after. 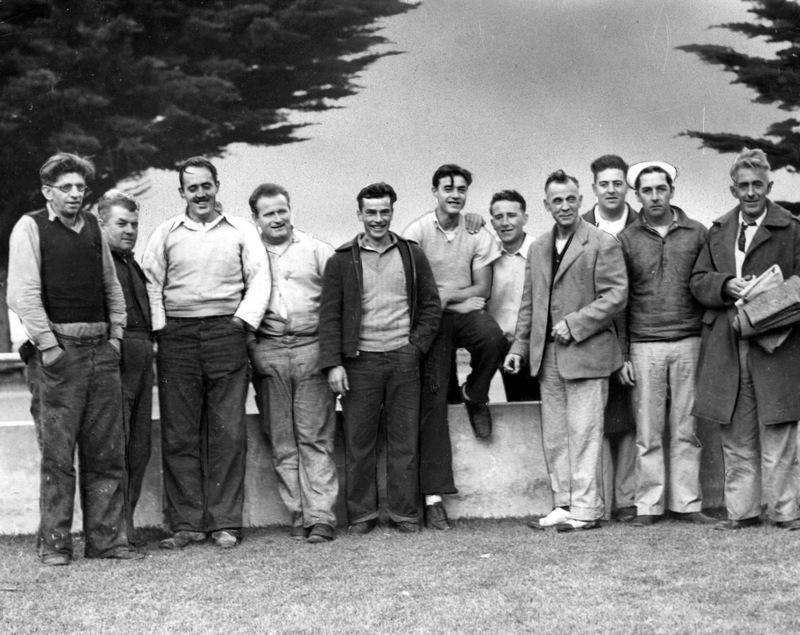 This photo, loaned to me by a Telford relation whose mother is in the photo, shows a mixture of the sailors, hotel staff and others, taken outside the hotel. The ship had been laden with Australian lead from Port Pirie and took only 35 minutes to sink. (4) Heritage Victoria has a good description of the incident using the Captain’s own words describing the incident. I wonder what became of these sailors and their families ? They started building the Cape Otway Lighthouse in 1846 and the first light shone in 1848. It was the second lighthouse completed but is the oldest surviving lighthouse. It was decommissioned in January 1994 after being the longest continuous operating light on the Australian mainland. 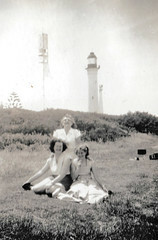 Meanwhile the Macquarie Lighthouse began as a tripod mounted iron basket which originally burned wood, and later coal. 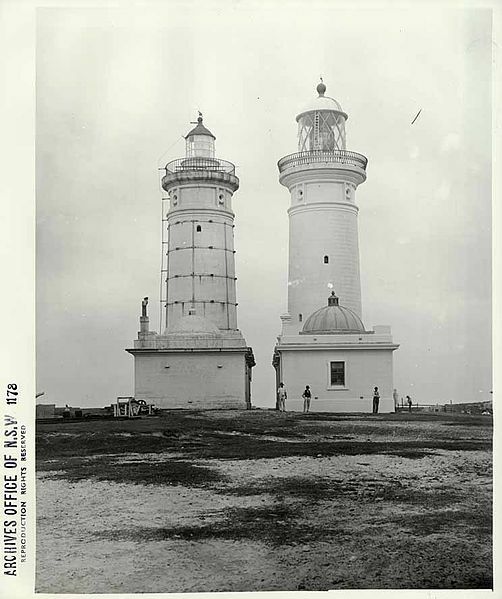 A sandstone lighthouse was built and began operation in 1818 but the sandstone eventually crumbled and a new lighthouse was built 4 metres away from the first one, lighting up in 1883 when the following photo was taken. Hey, hey, two lighthouses side by side, switch one off, switch the other on, so depriving NSW of that word continuous..
Woud I be right in saying Macquarie can claim the continuous area title and Cape Otway can have the continuous building/light title ! This entry was posted in Genealogy, History, Lighthouses, Shipwreck, Uncategorized and tagged 1880, 1940, Apollo Bay, Bass Strait, Cape Otway, City of Raysville, Eric the Red, fishermen, lead ingot, life raft, Lighthouse, lightstation, shipwreck, survivor, Telford on August 3, 2013 by lazycoffees.